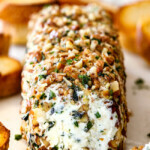 10 Minute prep creamy, savory Garlic Herb Goat Cheese Log is the EASIEST yet most impressive appetizer you will ever make! It can be made in advance so it’s the perfect appetizer for all your special occasions and parties! Add herbs to a medium bowl and whisk to combine. Remove 1 1/2 teaspoons to use in pecan coating. To the remaining herbs stir in lemon zest and garlic. Add goat cheese and stir to evenly combine. Add this cheese mixture to a large piece of plastic wrap and form into the shape of a log. Wrap in plastic wrap and freeze 20-30 minutes. We want the cheese log slightly firm so it holds its shape but is still soft enough for the Coating to be pressed into it. Line counter with a large piece parchment paper. Add pecans and reserved 1 1/2 teaspoons herbs and stir to combine. Spread Coating into a single layer square a little larger than the length of the cheese log. Add cheese log to the edge of the Coating and roll in Coating (see photos) until evenly coated, pressing coating into the cheese so it sticks. The cheese log can be refrigerated at this point until ready to serve or serve immediately. When ready to serve, remove cheese log from refrigerator 15 minutes beforehand so it can soften. Drizzle with olive oil just before serving. Serve with toasted baguette slices or crackers. To toast bread, slice baguette into 1/2” slices and arrange on a large baking sheet. Drizzle slices generously with olive oil. Bake at 350 degrees F for 10 minutes or until golden and edges are crisp. *You can prep the goat cheese log entirely in advance, wrap it tightly in plastic and refrigerate for up to 3 days. The pecan coating will not be as crunchy but still delicious. For a crunchier coating, you can prep the cheese log all in advance except for the pecan coating, then when ready to serve, let the cheese log sit for 15 minutes or so at room temperature to soften then roll in pecans. *You can mix up the herbs with your favorites!